SUBHEAD: "The power grid of the future will require sunny skies above and energy storage below. Thanks to Tesla, Kauai has both." ... and now the corporate takeover marriage will be complete. Images above: A corporation supported by underwriting by the Federal government. An average day of energy use on Kauai, before and after Tesla’s batteries came online. In 2016, the period of highest energy demand is met mostly with fossil fuels, after the sun has set. In 2017, solar power generated during the day is stored up and used at night, shrinking the island’s fossil fuel use by as much as 1.6 million gallons a year. From Kauai Island Utility Cooperative. Kauai is now in bed with Tesla. There is good and bad to that. Tesla is a corporation interested in space travel and autonomous technology. They have not found a way to make money manufacturing cars or spaceships - maybe because they are a thing of the past - or ought to be. 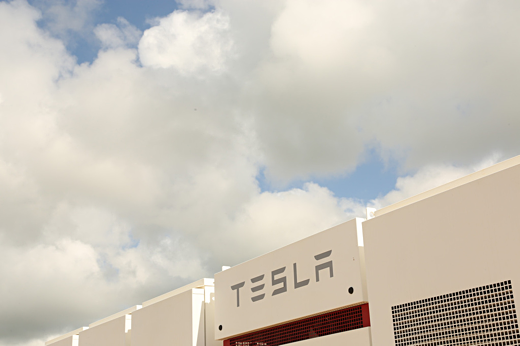 Tesla now wants to be your power grid. They chose to make colorful Kauai a test case for their plans. A great public relations stunt as well as a real experiment. You can bet their smart meters will know everything Siri and Alexa have found out in your home... and more. You can also bet that Teslaand the County through KIUC will make it increasingly difficult for individual home owners to be off the grid and on their own system. Living within our resources looks like an impossible goal. Even our best sustainability efforts are corrupted by an inability to let go of our planet crushing appetites. Our efforts to "keep it all running" on solar power cannot run the colorful display screens, the refrigerators/freezers, the microwaves, washing machines and automobiles 24/7/365. There are not enough rare earth metals and other required resources to supply that life we had suicidally burning fossil fuels. However, solar PV power can support a modified and reduced appetite for power. particularly if the PV panels are on your roof and the batteries in the garage. You'll stay within a reasonable energy budget or wreck your system. As Luke Evslin found out with six solar panels and a small bank of batteries. (see Ea O Ka Aina: Failing to live Off-Grid 1/3/16). The online article at Grist Magazine reproduced below is named "Welcome to Paradise: Batteries Now Included!"... 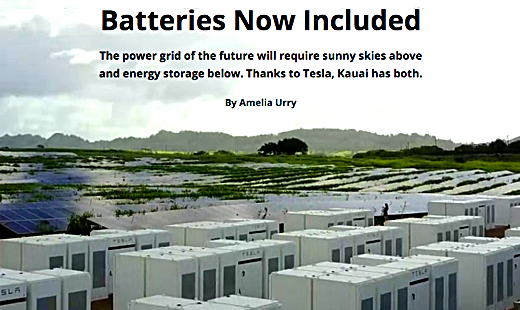 It's about Tesla and Solar City teaming up to building a game changing solar PV farm with battery storage on Kauai. What's funny to me is on the Grist website splash-page the article is tilted "Empire of the Sun: How Tesla is powering America's first clean energy paradise." That is closer to the truth. Tesla Corporatiion is doing what the Edison Company was doing over a century ago... creating a monopoly for power distribution. A century ago Nikola Tesla worked for Thomas Edison as Edison attempted to make power distribution practical. Early on, Edison recognized the limitations of DC power. It was very difficult to transmit over distances without a significant loss of energy, and the inventor turned to a 28-year-old Serbian mathematician and engineer Nikola Tesla whom he’d recently hired at Edison Machine Works to help solve the problem. Tesla's AC scheme was rejected and after selling his related power patents to Westinghouse he became a recluse while attempting, and unable, to convince the world to transmit power through the air like radio waves. The irony is that Tesla's scheme to transmit power would have been impossible to meter, and therefore of no use to Edison or Westinghouse interests. Tesla died a recluse feeding uncountable pigeons in his New York hotel room. It is ironic that Elon Musk invokes the "Tesla" name for his corporate interests. Free anything is the last thing on Musk's mind... unless its free money for Tesla Corporation in capitalizing and underwriting the cost of unaffordable electric cars. KIUC was "supposed" to be a customer owned co-operative, but was really a creation to bail out the failing Kauai Electric company for a whopping $270 million. As I've said before, we should have let Kauai Electric go bankrupt and suffered a bit and not end up saddled with unpayable debt charges added to our bills. The Tesla-Solar City offer will be another monopolistic yoke around Kauaians necks. It will discourage solo homeowner efforts or neighborhood and community attempts to generate any power. It will make Kauai self sufficiency less resilient as well as more brittle. Generating your own power produces a heightened awareness of limitations to power consumption. If the Tesla-SolarCity system encourages running AC through the night and unlimited use of refrigeration and electric cars, it will be merely another crutch in enabling us to go on with business as usual. All the throw-away technology, the plastics, the imported foods, flat-screen screen hi-def entertainment and sprawling development will continue like a cancer to devour natural life on Earth. Maybe we should be putting more effort into getting people not only "Off-The-Oil" but "Off -The-Grid". It may lead us into a cooperative, a commune, a commons, a guild, or life as a solo practitioner of a craft. Real life is in the water, soil, the plants, the birds and bees. Not the Tesla SUV multi-tasking trip to Costco for fresh imported tropical fruit. Of course, the efforts at the most local levels will be the most valuable. These Tesla Farms will supplant some agriculture, but worse their presence will accelerate suburban residential development. SUBHEAD: In fact there is an option that there might be a monopoly on energy worse than under Kauai Island Utility Coop (KIUC) in partnership with TESLA (probably along with Amazon, Google and Ebay). Images above: An industry supported by underwriting by the Federal government can afford to build a monopoly on Kauai as a test for bigger things. Centralized power distribution from free sunlight. The biggest race of the year is a daylong ocean crossing from the island of Moloka’i to Oahu’s Waikiki Beach, which can take between five and eight hours. Exhausted paddlers rotate out of the canoe during the race, jumping into the water to be scooped up by a waiting motorboat. During the first switch, Evslin was getting ready to heave himself into the canoe when the motorboat struck him. The propeller sliced across his back in five places, severing muscle and bone along his spine and pelvis, each cut a potential death blow. His teammates pulled him out of the ocean and rushed him to shore. Judging from the looks on everyone’s faces, Evslin wasn’t sure he would survive the hour-long trip to land. 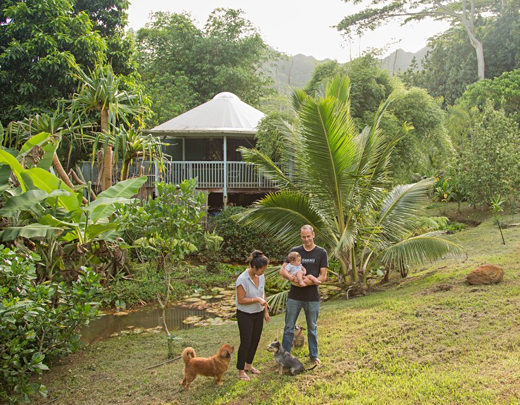 Image above: Luke Evslin and family stand in front of their yurt on Kauai. Not exactly paradise if you have to drive to get anything - even if you're driving a Tesla. From original article. Then there’s the water. Their water tank, which collects rain from the hill above the yurt, also provides a welcoming home for mosquito larvae. The tank’s lining recently sprung a leak, so the family has been living on jugs of municipal water hauled from Luke’s sister’s house. At one time, Luke might have thought of this as a betrayal of principle; now it’s mostly just inconvenient. Below are two charts of power supplied through KIUC to Kauai. Hydro-electric is in blue, burning biomass is in green, diesel generated electricity is in gray and solar PV (with battery storage in 20917) farm is in yellow. Image above: An average day of energy use on Kauai, before and after Tesla’s batteries came online. In 2016, the period of highest energy demand is met mostly with fossil fuels, after the sun has set. 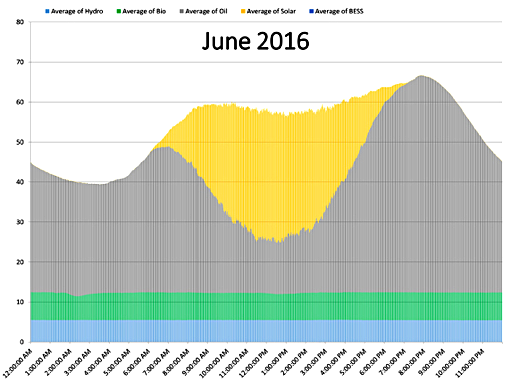 Solar PV power (in yellow) without battery storage is ineffective from dinner time until breakfast the next day. From original article by From KIUC. Images above: In 2017, solar power generated during the day is stored up and used overnight, shrinking the island’s fossil fuel use by as much as 1.6 million gallons a year. From original article by From KIUC. That’s why “there’s a finite limit” to how much solar power Kauai can consume right now, Rockwell says, showing me a graph of energy use over the course of a day. Between 10 a.m. and 4 p.m. on most days, Kauai nearly reaches its 100 percent renewable goal. 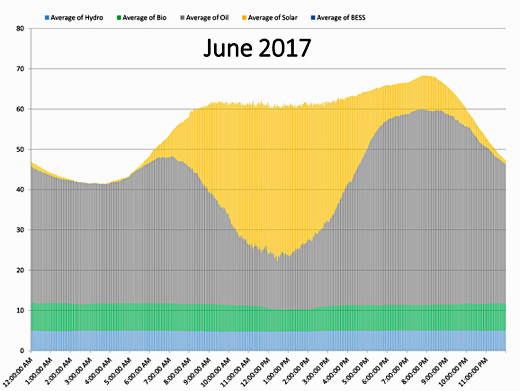 Rockwell points out a gap of only a few megawatts between solar supply and the total electricity demand during the daytime hours, represented on the graph as a slim gray wiggle of conventional power under a heap of solar power. Image above: Kauai Mayor Bernard Carvalho has been a corporate stooge for the Chemical-pesticide-GMO companies since he was elected. Now he a shill for unfettered suburban growth on Kauai tarted up with a "new" but not improved Kauai General Plan Update changing "Keep it Rural!" to "Make it Suburban!" and fueled by subsidized corporate energy monopoly. 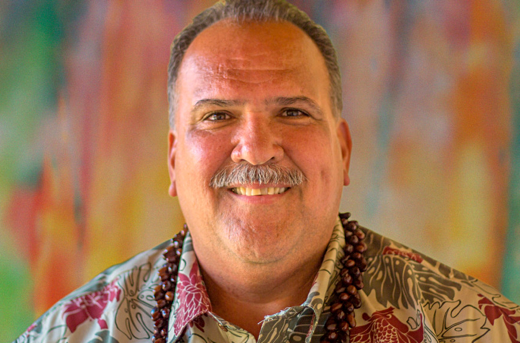 From (http://grist.org/people/this-hawaiian-mayor-is-scoring-touchdowns-for-clean-energy/). The economies of scale are such that Kauai’s utility cooperative can install a solar-and-storage unit for about half what it would cost a family to install the same amount on a house. Even when it comes to the island’s fossil fuel–generated power, the utility can produce more from a gallon of gasoline than someone with a $100 generator in their basement. Image above: Ester Emery and her family have been living off grid for years in the wooded northeast of America. First they built a yurt and added solar power with four panels and two 12v batteries for $1,000. It provided much needed lighting and other light duty like charging small battery operated tools - of course without a microwave or washing machine. They have built a bigger home from wood harvested off their property and are still off the grid. See more at (http://estheremery.com/videos/). 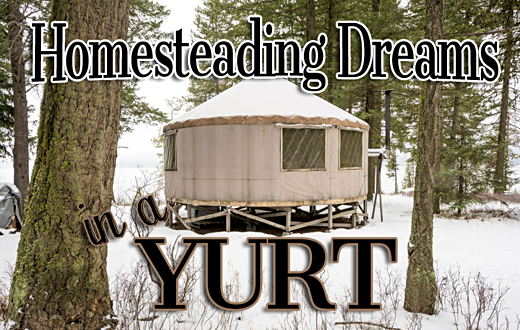 From (https://mollygreen.com/blog/winter-in-a-yurt-with-three-children/). So although the utility is offsetting some panel owners’ bills for their (less efficient) solar power, the rest of the utilities’ costs (like batteries) are divided among members who don’t have access to rooftop solar power.